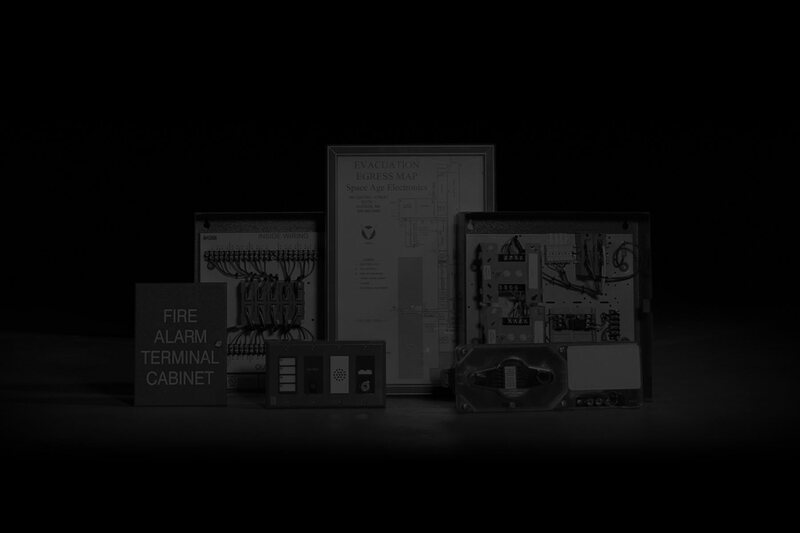 Smoke control systems are one of the most complicated and often misunderstood systems within a facility, and rightfully so. It’s important to point out that a true Smoke Control System vs a post fire Smoke Management System are two entirely different animals. To use an analogy from the animal kingdom which illustrates the differences between these two systems lets consider the use of water by a fish (Smoke Control System) and a camel (Smoke Management System). Both the fish and the camel need water to survive, however a fish uses the water as a medium in which to live while the camel uses its water as fuel to travel great distances. Similarly, a Smoke Control System manages the medium of smoke in order to increase egress times so that occupants can escape safely. Conversely, Smoke Management Systems are used during post fire events to remove smoke from a facility and/or restrict smoke from entering specific area’s of a facility during general evacuation. Since this is a Webblog and not intended to be a fully comprehensive lesson plan on these two different systems, only high level concepts will be discussed. The intent here is to provide a solid framework around which more details and further conversation can take place. Always feel free to contact me should you be so compelled to delve deeper into this subject matter. Understanding the Smoke Control design and installation process can be difficult with challenges at each phase of the project. These systems are generally code mandated based on occupancy type, architectural construction methods, occupancy loads and a variety of other factors. With no single entity or trade being solely responsible for the entire solution, the interdependency across all professional engineering and installation trades is critical for a successful project. 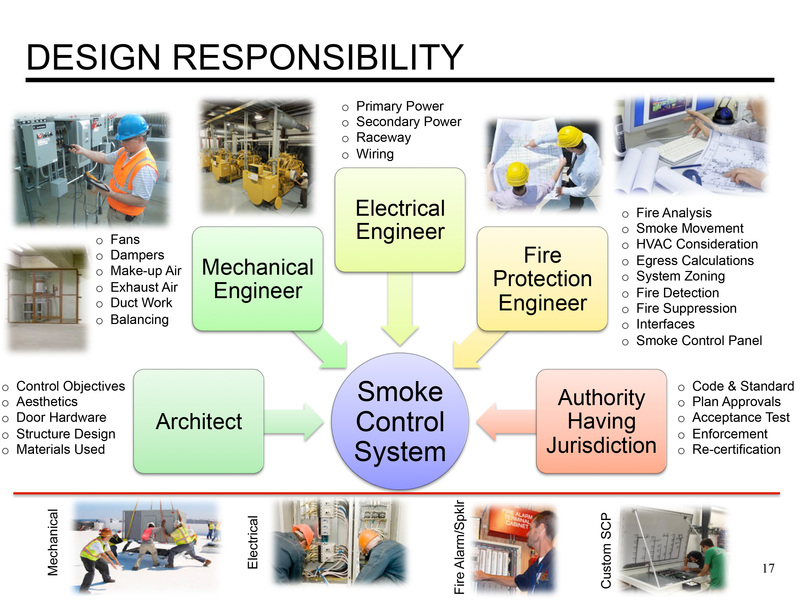 The graphic below is an illustration of individual disciplines that are required for a properly engineered and installed smoke control system. Smoke management systems will have many of the same people involved but at a lesser degree of involvement during design, installation and testing. It all starts with the architects building design. The facility must be designed for safety and for proper egress in the event of an emergency. Once the structure shape, size and materials are pinned down, the mechanical, electrical and life safety systems are designed. Coordinated efforts are made at this stage to develop a scope of work and specifications that clearly describe with great details the systems performance criteria along with materials to be utilized. Rounding out the process is the Fire Protection Engineer and Authority Having Jurisdiction. Both of these two parties are to ensure that proper engineering designs are being applied, codes are being met and the contractors executing the work are delivering the proper solution as specified. The installation, or execution phase of the system, is performed by several different trades either sequentially or concurrently during the projects construction. Coordination between these trades is critical for timely completion of these complicated systems. More importantly is the communication that takes place between the project managers of each trade and the crews that perform the physical work. In the early stages of the project, cross functional meetings are not as frequent as towards the end of the project when final testing and commissioning takes place. Specific milestone meetings at each major phase of the project are critical to keeping all trades coordinated with each other. These check points ensure everyone is moving in the right direction and has everything they need to complete their project scopes on time. Hopefully this high level overview of smoke control and smoke management systems provided enough detail for our readers to acquire a holistic view of responsibilities by various parties for these complicated systems. Future Webblogs will expand on this broad topic helping our customers make better informed decisions for the products and services they deliver. I really enjoyed your overview article on smoke control vs. smoke management. Where did the diagram come from that is page 17 of something. I think that would greatly help me convince the design team on the project I am on that they MUST employ a fire protection engineer to do a rational analysis on the smoke systems.